Do regular daily activities like walking, running, or shopping cause your feet to feel sore and fatigued? If your answer is, “yes,” then you are not alone. Over 70% of people in the United States suffer daily with painful feet. The good news is that having the right pair of innersoles can dramatically improve the way your feet feel; effectively reducing pain, swelling, aches, fatigue, and a whole slew of other complaints related to the foot. There are many benefits that are gained from using the right shoe insole, including; added comfort, orthopedic correction, expedited recovery from injuries, odor reduction, and heightened athletic performance. We've switched out a few products to best reflect some of the best insoles of spring 2019. There is also a "Bottom Line" section at the bottom of the page, outlining what you should be looking for in finding the best insole for your needs. The recent update reflects the best of 2018’s shoe innersoles of all types, shapes, sizes, colors, with new information as to how to choose the best shoe innersoles and our criteria for evaluation. Also, included are some of the most frequently asked questions about shoe innersoles. The most recent updates include the addition of five more of the best shoe insoles, bringing our list up from 10 to 15 products. As well as adding even more of the best shoe insoles to the list, we have reviewed all of the information on this page and updated it accordingly to ensure that the most relevant and up-to-date information is available to the reader. We have also improved on our 'Criteria' section to deliver the most relevant content possible and a 'Terminology' section has been added highlighting the most vital terms from this page. Top 10 Best List has been carefully constructed to reflect the best shoe insoles on the market. This list includes; Dr.Scholls Extra Support Insoles, Spenco Rx, and New Balance Supportative. Spending a lot of time on your feet- especially at work- is just a regular part of life for a lot of us. Foot pain, however, doesn't have to be. 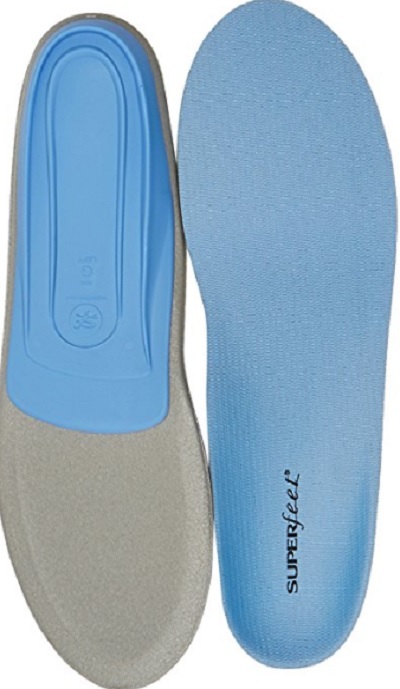 These insoles from Dr. Scholl's are specifically designed for use at work and feature the brand's signature gel technology. This gel offers a wide range of benefits, which we'll discuss in more detail after the jump. Massaging Gel Technology is the signature feature in Dr. Scholl's insoles and for a good reason. It offers a variety of benefits, including shock absorption and overall comfort. It absorbs some of the shock and pressure put on your feet, which can be multiple times your own body weight. This, along with the comfort factor, reduces pain and fatigue, even if you're on your feet all day. It's important for an insole to be able to be used in a wide range of shoes. While some insoles are specifically made for a certain type of shoe, more versatile options like the Dr. Scholl's Work Gel insole are more popular because of their versatility. 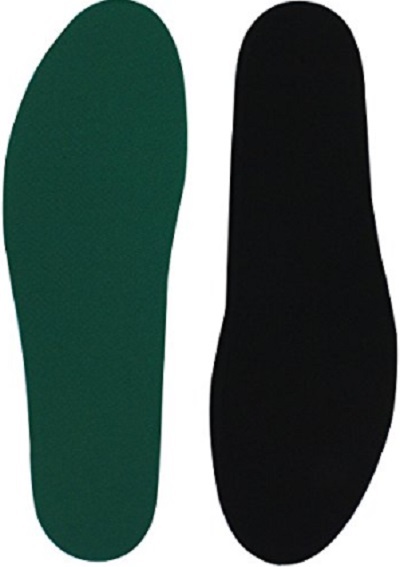 These insoles work very well in boots, dress shoes, casual shoes, or even sneakers. On the bottom on the insole are score marks that correspond with different shoe sizes, making it easy to cut them to the appropriate size. Cradling the heels and supporting your arches are just as important as proper posture and lifting techniques. Powerstep Original innersoles provide comfort and convenience, without the hefty price tag of a personally-fitted medical insole. Super thin and low on its profile, these dual-layered, moderately cushioned innersoles are a perfect complement to any highly active consumer's footwear. Beautifully crafted to fit in any shoe without trimming, the anti-micro constructed Powerstep insole is designed for high-endurance activity and continuous standing, regardless of the surface you walk on. An aesthetic as pleasing as the insole itself, Powerstep insoles provide the user with moderately rigid support of the arch and heel cradling to alleviate and reduce foot pain. When faced with the possibility of disability, why skimp on the quality of a well-established brand that's been a mainstay in foot support for nearly ten years of production? In other words, you will be happy you made the investment. The Powerstep Pinnacle is designed to offer targeted and controlled cushioning to amplify the comfort of your shoe. The Pinnacle yields a semi-rigid arch support that is both firm and flexible, along with a long-lasting EVA base and ample top-layer cushion. If you suffer from foot pain associated with plantar fasciitis, tired achy feet, moderate pronation, or other common conditions of the foot, then this is the perfect orthotic option to alleviate your discomfort. Powerstep insoles are made with VCT® (Variable Cushioning Technology), a high-performance foam that offers a soft and supportive wear which softens to conform to the shape of the foot. This contoured insole is anatomically shaped to provide strong arch support and cradles the heel for all-day comfort. 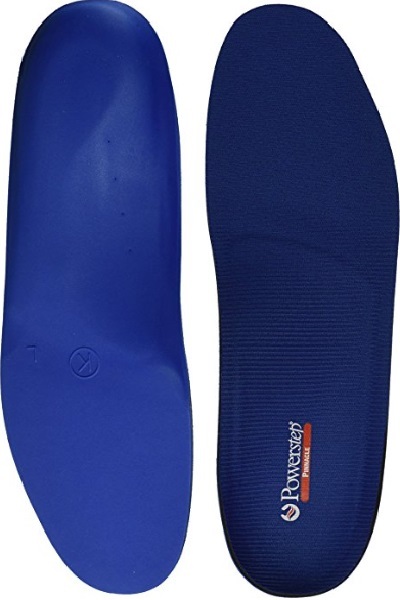 The Pinnacle is an orthotic insole that will work hard to alleviate the symptoms of various foot problems, including; plantar fasciitis, fatigue, pain, and mild-to-moderate pronation. Boasting dual-layered cushioning that is both targeted and controlled, this insole will noticeably lessen your foot pain and let you get back to doing the things you love. For those of you in need of low profile, medium arch support, these innersoles are perfect. They are made with closed-cell foam, have NXT anti-bacteria coating, are latex-free, and vegan-friendly. These are good for common foot pain, plantar fasciitis, arch and heel pain. Since they are low profile, they will fit in most shoes. The NXT anti-bacteria coating promotes healthier feet by reducing the chance for bacteria growth. This means they will last longer and do well in the area of fighting against an unhealthy foot environment. Medium arch support is what this pair is designed for. If you are in need of a lot of arch support for higher arches, then these are not for you. For those with low-to-medium arches, however, these are perfect. These are a bit pricey, in terms of cost comparison with others on this list. They are, however, made with durable construction, promote a healthy foot environment, and aid in reducing foot pain. As such, this pair is a great choice for investing. Sof Sole Athlete innersoles is a sports-tested product available to the most discerning and industrious of athletes, shop workers, streetwalkers, and hyperactive stage performers. These are synthetically designed with gel cushioning, in order to provide the durability and comfort needed to push your body to its absolute max and increase endurance for the marathon runner and construction worker alike. Top-rate, synthetically-molded insole with a gel heel comfort encasement allows the would-be Olympian to run shuttle sprints up and down the running trails for extended periods of time. While it’s nothing like walking on a cloud, these are a close second with a neutral design in the arch and wet-resistant material for almost any climate condition. These are midrange in cost association. When it comes to providing the absolute finest in athletic and occupational insoles, the cost is never an issue with quality materials and meticulous design in mind for your chosen footwear. Timberland is a brand recognized for their high-profile workwear and top-quality leather. Now, they have innersoles, as well. These unisex anti-fatigue innersoles are a complement to any tough-as-nails working shoe in the market. With anatomically contoured arches and heel space, this is a great pair to have. 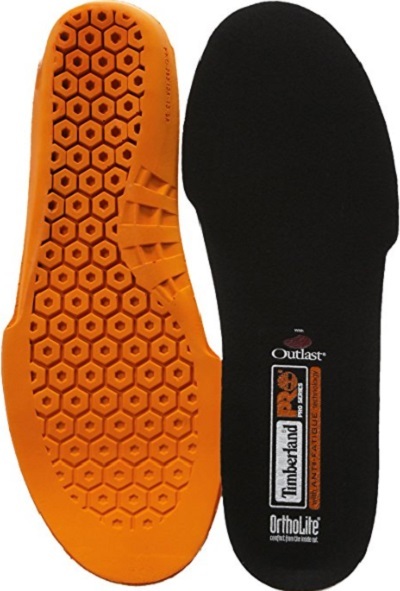 These insoles are, certainly, built with a highly-deft set of hands to place into any Timberland boot available or other footwear of your choosing. Moreover, they have an inverted cone design that is both lightweight and supportive. These insoles are built as if they were feet themselves, feet that were designed with anti-fatigue technology and a synthetic sole to help regulate internal temperature and circulation. These Timberland insoles are midrange in price. Made with OrthoLite® and anti-fatigue technologies, this is a pair worth considering for your next purchase. These have a design for a woman's foot having medium arches. There is the NXT anti-bacteria coating to help fight against odor-causing bacteria and high-impact foam to help reduce load-rate. These are latex-free, vegan-friendly, are 2 inches high and 4 inches wide. 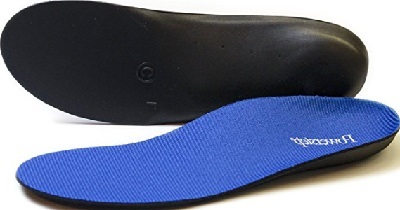 This insole, also, helps to alleviate general foot pain, heel pain, plantar fasciitis, and arch pain. They are perfect for women who need intermediate support. These have a slim heel and arch length to match a woman's foot. This helps to better stabilize and support the foot; thereby, reducing overall load-rate. These provide decent shock absorption during more active events, such as jogging, running, and walking. They are, also, good for those who might find themselves on less-forgiving surfaces, such as concrete. These are at the upper end of the price range. They are biomechanically engineered which reflects in the price. These do, however, have a high-quality build about them and contain decent technologies. As a result, they are worth every penny spent. Sometimes a heavy duty insole is necessary, especially for those who are on their feet a lot or need something hefty for their work boots. These Polysorb insoles from Spenco are made specifically to be heavy duty and provide the support your feet need without compromising overall durability. The stretch fabric and antimicrobial treatment work to mitigate blisters and odor, while the forefoot section features additional EVA padding for further support. Everyone's feet are different, and some will require more arch support than others in order to be fully comfortable. These insoles are outfitted with a lightweight polyurethane foam that is designed to properly support even high arches, as well as further supporting the heel. 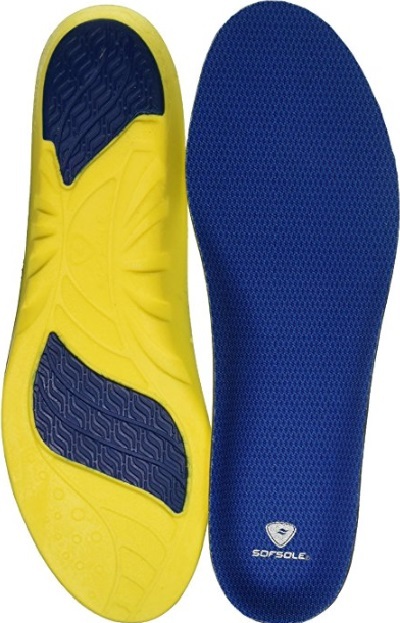 A specialized strike pad in the heel section also works to absorb shock, reducing the likelihood of fatigue and pain. Shock absorption and energy return often go hand in hand. Where shock absorption refers to how well the insole handles the pressures placed on your feet, energy return is the proverbial "bounce in your step" that is often a result of good shock absorption. The strike pad in the heel, along with an EVA pad in the forefoot, work together to handle the shocks and pressures placed on your feet and return some of that energy back to you. Sleek, simple, slimming are the first three words conjured up when talking about Spenco Rx innersoles. They are low profile with absolute comfort; allowing the wearer to move along most work surfaces without added stress on the heel and plantar. 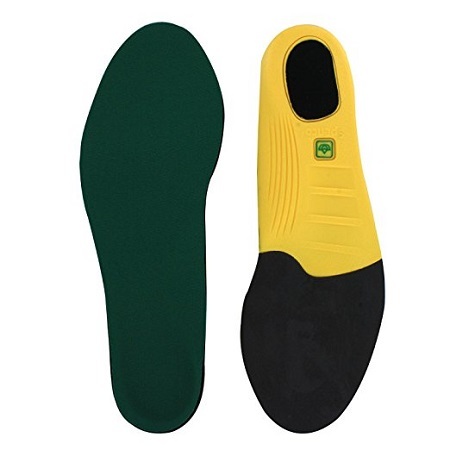 Considering the small size of the insole, it can be placed on top of the original insole without hassle. These offer a pliable fabric that provides extended coverage of the shoe and odor-fighting properties to provide ample levels of comfort during long stretches. While the low profile of the sole may seem off-putting to some, the ability to place them on top of other insoles for additional comfort is a true blessing in itself. Cost-effective comfort without breaking the bank is something all insole developers should strive to achieve. This is truly a great option for those looking for price-friendly solutions. Never judge a book by its cover and, in this case, never judge an insole on its matted cotton-ball appearance. These are German-made, are eco-friendly, and are a delight to the wearer, regardless of the size of clogs they’re wearing to the dance hall. Designed to be worn by those that don’t wear socks, these innersoles provide structural integrity and the well-ventilated comfort. Designed with high-quality terry cloth and environmentally-safe latex padding, these re-washable wonders provide added convenience for the free-footed pedestrian. Elegant in its design and materials, the soft padding of latex and terry cloth allows the wearer to enjoy the summer breeze; not only in their face but on their feet, as well. German engineering comes at the consumer at a budget-friendly price. For a sure fit for your summer wear, you’ll not find a better pair of insoles for your slip-on footwear. Dual-Layer Cushioning: Designed to provide targeted pressure relief for your feet that helps to give you great comfort during any of your athletic activities; as well as, when you’re standing or walking for long periods. Gel Padding: Gel padding provides an excellent amount of cushioning that reduces any pain or strain you may currently feel when you take a step. Gel padding is a great feature that will keep your feet feeling great all day long, so you won’t have to worry about sore or achy feet. Metatarsal Pad: The metatarsal pad redistributes the weight and pressure on your feet; helping ease symptoms of common foot problems, such as plantar fasciitis. Memory Foam: Memory foam would be something to search for if you desire a unique comfort for your feet. The memory foam molds itself to the contours of your foot when you step down on it. The molding to the shape of your feet helps to give you the best comfort that’s specifically tailored to you. A lot of innersoles are designed to give full-length cushioning, but some focus on providing cushioning to certain parts of the foot, such as the forefoot or heel. It’s best to look for an insole that is specific to the area of the foot where you most often experience pain or discomfort, as they will be more suitable for your needs. Something else you might not be familiar with is the heel cradle feature with some shoe inserts. The heel cradle is great for cushioning your heel by helping your foot absorb those impacts in your steps; making for an easier time walking around. The material can, also, play a role in the important comfort you’re looking for with your insole. Inserts made with material such as pure cotton terry with padded latex, which we know how incredibly soft cotton can be, is an example of the kind of softness you can get that’ll feel great on your feet. Also, shoe innersoles, such as orthotics, make their inserts with material fabric specifically to benefit medical professionals who have long work hours on their feet. Lastly, any insole that’s said to have durable construction is, also, a great sign that it will give you maximum comfort for your everyday needs. Something else to look out for is whether or not the insert has a break-in period associated with it. Some innersoles may take as long as two weeks to break in, and this is an important factor when considering your purchase. If you are heading out on vacation and place one of these inserts into your footwear, there’s a good chance your vacation will be spent with moans of foot pain. You don’t want to spend your time breaking them in, instead of enjoying the day, as it were. So, it is vital to watch out for break-in periods associated with your inserts. Sometimes the shoes you wear, such as sandals or flip-flops, don’t give you the necessary support that your foot needs, in order to avoid feeling strain and soreness. Failure to get that arch support and foot support, in general, can lead to a number of foot problems, such as foot calluses and muscle spasms. An anatomical footbed can be a great place to start, as it’s designed to support the natural shape of a human foot and, also, helps to center your heels with each step that you take. Other great shoe inserts are ones that can adapt to all foot shapes to give the best support. High Arches: If you have a high arch, most of your weight goes on your heel which may be where you feel most of your foot pain. The insole that highlights being high-arched will be best for giving you that necessary foot support. Low Arch: Low arches require solid stability which is why individuals with this type of arch should look for an insole with firm cushioning to help stabilize the foot. Unsure: If you’re not too sure whether the arches in your feet are too high or too low, then you should opt for finding shoe innersoles featuring a neutral arch design. Inserts designed in this way are, generally, able to fit most foot types and give you all the adequate support you need. You can, also, keep an eye out for the semi-rigid arch support feature, which is designed to provide maximum stability to your feet. An arch shell is another great feature you can find for adding stability to your steps. It helps to give you more effective motion control, along with some better side-to-side stability and perhaps a great feature to have in your next purchase if you’re an athlete or a dancer. With innersoles adding to the density and mass inside of your shoe, there’s a concern for heat increasing inside; thereby, causing sweating, odor, and unfortunately creating a breeding ground for bacteria and infections. It’s important your footwear insert can provide air circulation to help keep things cool inside. One feature that would help you would be the perforation feature. Similarly, the way they work with shoes, these openings allow for air to flow through the insole to decrease the temperature inside. Pay attention if any footwear insole you see highlights their cover or fabric as being designed to keep your feet cool. There are a lot of features you can find to help control any potential odors that develop in your shoe. The first one worth mentioning is active carbon fiber. An insert with that particular material has it just for the sole purpose of minimizing odor. Another feature you can look out for is a Silpure antimicrobial, which in addition to controlling odor, can help to prevent blisters, too. With sweat being the main culprit of odor, you want to find something in an insole that can reduce that. A great find would be an insert that has a built-in moisture management treatment, which will reduce moisture in the shoe and, thus, reduce odor. As mentioned earlier in this specific criteria, heat buildup in a shoe can be a breeding ground for bacteria. An insole that features anti-bacterial coating will keep the bacteria at bay and help maintain the health of your feet. While most insoles do come in sizes to help fit you properly, you can always check the manufacturer's instructions for fit, and determine if you can cut down the insole slightly, for a more customized fit. Other insoles will adapt over time, and heat, to the shape of your foot. While it may sound cliche', insoles can help extend the lifespan of your footwear, simply due to adding a bit of extra support and cushion. Materials in our footwear will break down over time, and if you're not quite ready to part with your favorite pair because the cushion has compressed, insoles can help give that extra longevity to your shoes. innersoles are often referred to as inserts, footbeds, or inner soles and can be purchased separately from your shoes to improve upon and enhance the overall comfort and wearability you experience. innersoles have all kinds of benefits besides just making your footwear more comfortable, for example; they can make shoes that are too big fit your feet perfectly, along with helping to prevent blisters by stopping your shoes from rubbing. For anyone who is on their feet walking, or standing all day, investing in a quality pair of innersoles is paramount to keeping your feet healthy and happy; preventing discomfort and foot pain. These days, the task of finding the perfect insole has never been more difficult. With so many options and unanswered questions, it can leave the consumer confused and uncertain, especially without doing appropriate research on what’ll be the best yield for them. When considering what type of insole you’re looking for, take into account the type of activities you’ll be pursuing while wearing the inserts. Also, recognize what type of footwear you’ll be placing them into so as not to choose a lightly padded insert when you’ll be hiking up mountain cliffs and, thus, desiring you had chosen a set of thicker gel innersoles, instead. Regardless of the decision you make or level of uncertainty you have in your future purchases, feel rest assured with this buying guide; providing you with the comfort and confidence to make the right choice for the right set of feet. q: What are the best shoe innersoles for my feet? It all depends on your particular foot needs and your personal preferences. If you’re a person that desires just having more softness in your steps throughout the day, certain shoe innersoles like Orthotics tend to provide more cushioning than arch support. If you’re a person whose feet need more arch support because of certain foot issues, then you need to look out for innersoles highlighting their arch supports and heel cups, or ones specifically designed for athletic shoes would be a good possibility for you. q: How do I cut the insole to the size of my shoe? Sometimes with certain shoe innersoles you purchase, they’ll come to you larger than the size of the shoe you wear requiring you to cut down to size. The first thing you need to get of course is a pair of scissors. Then you need to pull out the current insole inside of your shoe. Put the old insole you removed on top of the new insole you purchased, and align it with the back of the heel and the arch. With a pencil or marker, mark around the old insole to have a marking of what extra pieces you need to cut off on the new insole. Once you do that, cut around the new insole to get sized down to the old insole and then stick the inserts inside of the footwear. After this, you can stick your feet in and take joy in all of the comforts. By the way, if you can’t remove the shoe’s original insole for some reason, stick a piece of paper in the shoe, draw around the corners inside of the shoe to get its exact size. After you do that, cut the piece of paper to that size and then follow the rest of the steps, starting from the part where you would have put the old insole on top of the new insert. Finally, some innersoles are made in such a way that you cannot cut them down at all. In situations like this, you need to be really careful about sizing. q: How do I clean my shoe innersoles? The best way to clean your inserts is to simply wash them with soap and warm water, carefully making sure not too much water is absorbed in them. Insole experts advise that if they are foam or cloth material, you shouldn’t use any water on those inserts, as it’ll damage them. Stains that are difficult to get out can be cleaned up with the use of a small brush. Once you’re done cleaning with soap and water, rinse them off, and leave them to air dry. It’s recommended not to put them in any drying machines. q: When do I replace my shoe innersoles? It depends on your level of activity. If you’re not standing or walking around for hours of the day, then it’s suggested they will be probably last 6 to 9 months. The more you’re on your feet, the closer to the shorter end of that time span your insole life-expectancy will be. q: Do all innersoles fit well with any shoe? Not necessarily. Some innersoles are specifically designed for shoe types like athletic and casual shoes. Also, some innersoles can just be put into shoes, while others require you to remove the original insole first. So keep in mind the particular usage being highlighted on the description of the shoe insole you’re looking at, as well as the fact that you might have to trim your insole down to size as some of them can be large and wide.